April is going to be a pretty busy Month but I’ve loved my pop ups at West Elm in Kingston and I’m delighted to say that I’ll be back again at the end of the month. Very excited to have been selected for this prestigious event in York. art& is 3 day event celebrating art, design & contemporary craft at York Racecourse Events Centre, North Yorkshire with 120 artists showcasing work. It will be a particularly special event for me to be doing as it will be the first time I have exhibited out of London. The Spring edition of this favourite event is back at the gorgeous Highgate Literary and Scientific Institute in April..
As ever, I will be amongst a wonderful selection of designer/makers and it will be lovely to see you if you can make it. Sometimes, you just have to go for it and thankfully, in this instance, I did! Having loved the experience of exhibiting at The Exhibitionist Hotel, I decided that my next challenge would be to exhibit at an art fair, alongside others. I’d heard about Roys fair and loved the ethos behind it - a fair run by artists, for artists - and so decided to apply. I’m over the moon to have been accepted and cant wait to take on this next challenge. Its a free event and held at The Bargehouse, an amazing venue behind the Oxo tower on the Southbank - do come if you can! Back to the gorgeous Lauderdale House in Highgate for my last event of the year. Really hoping that the weather doesn't scupper my opportunity this year as despite living less than a mile away, the snow had other ideas and we couldn't get the car full of my plates up the hill! Delighted to be back trading again at this, one of my favourite events of the season. Its a weekend event with 50 + traders each day and I'm there on the Saturday. Another great local event where I will be sharing a stall with my husband who will be there with his delicious Van Dotsch Speculaas spice mix and various tools for baking his spice based goodies. My only worry is that it is outside - we just have to hope and pray that the weather is kind! I'm delighted to have been invited back to do a pop up shop at the fabulous West Elm store in Kingston. Anybody who came to visit me in April at the store will know that the store is full of gorgeous homewares and it is an honour and a privilege to be able to set up my shop within their shop. Come and say hello if you can - I'd love to see you/meet you! A favourite event at the gorgeous Highgate Literary and Scientific Institute is happening early November. As ever, I will be amongst a wonderful selection of designer/makers at this event that is the first of a series of seasonal events. My exhibition just happens to coincide with the London Design Festival (15th-23rd September), and I am delighted to announce that I will be taking part in a panel discussion at the hotel on Monday 17th September in the evening. Vestalia Chilton, the curator at the hotel, will be moderating a discussion about sustainability in design with me, Camilla Kelly from The Mint List and Stefanie Bergot from Artbridge. The event is free and drinks will be provided but if you are interested in coming along, it would be great if you could register here where you will find more information about the event too. I can't quite believe that I'm writing this, but I have been invited to have an exhibition of my upcycled vintage plates at this fabulous hotel in South Kensington. As the name suggests, it is just that - home to an eclectic mix of changing exhibitions in their lobby, on their corridors and in the bedrooms. Exciting and terrifying are the two words that come to mind right now but 'it will be alright on the night' as they say! The opening of the show coincides with The Kensington and Chelsea Art Weekend and on Sunday 29th July, I will be at the hotel 'in conversation' with the editor of afternyne magazine. It will be from 3-4 and is a free event, but you need to register via Eventbrite here. Please do come along if you can make it! With a two month exhibition, obviously I wont be there the whole time but if you are planning to go, please let me know and I will try and coincide. I love the Crafty Fox Market experience and am very excited to be trading with them again at a fabulous new venue, Kindred Studios in Queens Park. I'll be there on Sunday 10th June but it is happening on Saturday 9th too with 70+ traders each day and plenty of things going on in the open studios. This is the first of the outdoor events so fingers crossed for brilliant weather at this great market on the Green outside Hornsey Town Hall! I'll of course be there come rain or shine but hoping that you might make it too. It's all part of the week long Crouch End Festival and if last year is anything to go by, it should be fun. Very excited to have been invited back to do a pop up shop at the fabulous new West Elm store in Kingston. Anybody who came to visit me in October at the Tottenham Court Road Branch will know that the store is full of gorgeous homewares and it is an honour and a privilege to be able to set up my shop within their shop. I'm back at the gorgeous Lauderdale House in Highgate for my first event of the year! I am taking two tables so that I can have both the upcycled vintage plates and tableware on display. The last Duckpond Market that I was supposed to just before Christmas was just a little scuppered by the snow - having packed the car, we couldn't move it out of a very icy parking space at the bottom of our hill. Hoping not to have a repeat experience. . .
Love this local market that will be my last for the year. Gorgeous venue, gorgeous range of artisan traders. Very excited to be trading for the first time at Urban Makers East in Hackney. In amongst an awesome bunch of traders that will be one of the destinations for Xmas gifts. The lovely Maxine Michaelides who runs the online Stanley Road Store will be having an open house showcasing a range of artists at 25, Stanley Road, Brighton BN1 4NJ. It will be open from 11-6 on the weekends of 25th November/2nd December/9th December and 16th December - I wont be there but some of my work and plenty of other gorgeous creations will be on show and for sale, so if you live in Brighton, may be worth going down there. Very excited to have been invited to trade here! Its all taking place at the new Circus West Village at Battersea Power Station and I will be trading alongside a range of other designer makers. Love to see you if you are in the area! Delighted to have my 'catch of the Day' tableware range in this special Xmas pop up shop, celebrating the work of British artisan designers. I met Linda Tait, the delightful lady behind the initiative, when she visited my stand at Top Drawer in September and promptly placed an order for the plates. The store is full of a range of gorgeous gifts and is the key store for Xmas gift wrapping in Covent Garden. Its on Floral Street - number 17 - in the same street as the likes of Agnes B, Paul Smith, Arket and the new concept store, Kent and Urwin. I'm off to explore today. . . The stuff of dreams and an incredibly exciting opportunity! I've been invited to have a weekend Pop Up shop by the gorgeous West Elm store in Tottenham Court Road. I am incredibly excited about this - a first for me to be doing a trade show and a brilliant opportunity to share my tableware with the retail world. And it was wonderful to have been selected to be part of the exclusive area, 'Spotted' - a destination area for new, exciting brands who have never done a trade show before. As it is a trade show, it is not so easy to get tickets but let me know if you are interested in attending and I will see what I can do! Fair In The Square is a highlight of the year for me and I'm delighted to be trading again at this wonderful, local festival in June. It takes place in Highgate Village - mainly around Pond Square and down the top end of Highgate West Hill. This is the second year for this fabulous event and although I can only attend for Friday evening, the market is on Saturday too. It takes place at The Brighton Unitarian Church in New Road, Brighton and if last year is anything to go by, will be an event not too be missed. A first time for me to be trading at the UK's biggest Community Arts Festival in the very local Crouch End. It starts at around 10.30 and there is plenty to do and see as well as shop at the fair on the green outside the gorgeous Hornsey Town Hall. As ever, it will be lovely to see you there is you can make it! I have been privileged to do a few Crafty Fox Markets now which have mainly been in South London - now for the first time, I will be amongst 70 other awesome traders at Their Spring Market that is being held at The Oval Space in Bethnal Green. 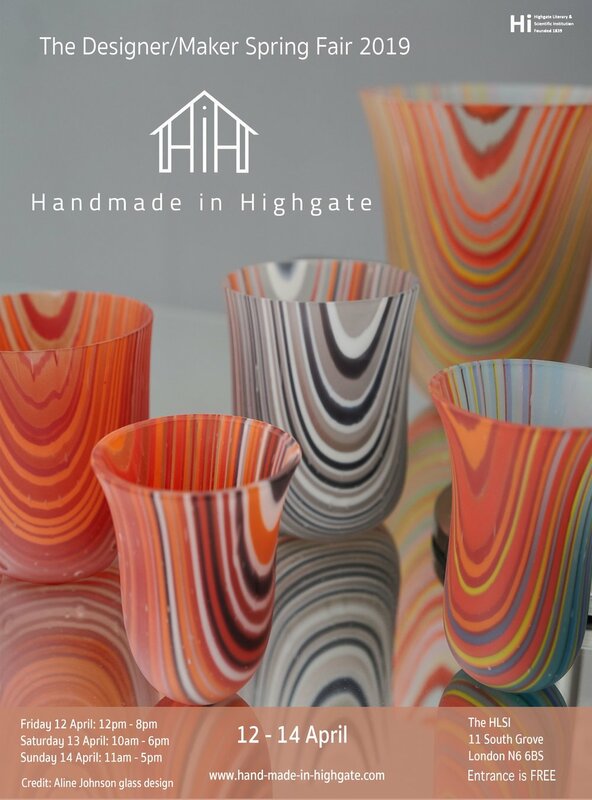 Excited and delighted to have been selected to exhibit at Handmade in Highgate - a new, local event at the fabulous space that is The Highgate Literary and Scientific Institution. I'd love to see you if you can make it over the weekend - Friday evening is a private view where there is a £3 entry but everything will be 10% off. Otherwise, entry is free and will be open Saturday from 11-6 and Sunday 11-5.